It’s a great honor for me to participate this week as we celebrate a great woman and inspiration for us Julia Child. She and her zest for life, left us an incredible culinary legacy. His great ispiracion French food that led to devote the rest of his life to a culinary career muchosde inspired us to be great cooks. This week at #SundaySupper we are celebrating her 100 years and not for the fact that she is no longer with us keeps us from celebrate in style. For those who had the pleasure to meet her and work with her is definitely a very special day for all of us that we have the videos and books has been an amazing school. A great woman, wife, feisty and full of desire to succeed and transmit everything that she’s passionate, food. Celebrate with us in this day and enjoy delicious recipes inspired by a great woman Julia Child. Peel the eggplant and cut into lengthwise slices 3/8 inch thick, about 3 inches long, and 1 inch wide. Scrub the zucchini slice off the two ends, and cut the zucchini into slices about the same size as the eggplant slices. Place the vegetables in a bowl and toss with the salt. Let stand for 30 minutes. Drain. dry each slice in a towel. 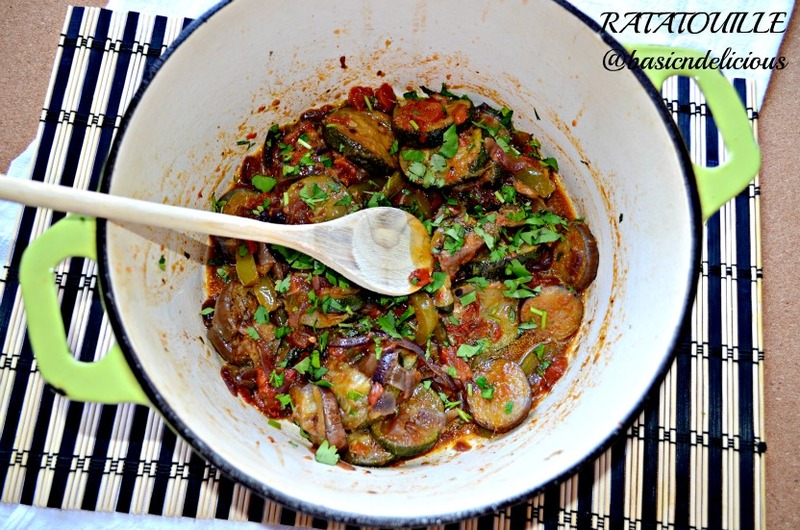 One layer at a time, saute the eggplant and then the zucchini in hot olive oil for about a minute on each side to brown very lightly. Remove to a side dish. Slice the tomato pulp into 3/8 inch strips. Lay them over the onions and peppers. Season with salt and pepper. Cover the skillet and cook over low heat for 5 minutes or until tomatoes have begun to render their juice. Uncover, baste the tomatoes with the juices, raise heat and boil for several minutes, until juice has almost entirely evaporated. Cover the casserole and simmer over low heat for 10 minutes. Uncover, tip casserole and baste with the rendered juices. Correct seasoning if necessary. Raise heat slightly ans cook uncovered for about 15 minutes more,basting a spoonful or two of flavored olive oil. Be careful of your heat, do not let the vegetables scorch in the bottom of the casserole. This recipe make 6 to 8 serving. If this recipe just make you drool here is a list of more recipes, the this incredible family make to celebrate this great day. This entry was posted in #SundaySupper and tagged healthy, vegetables by Kathia Rodriguez. Bookmark the permalink.